Renovations of a 200 year old barn in the Catskill Mountains of New York State. 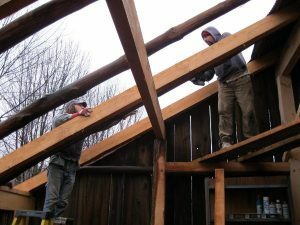 Weez uses classic timber framing techniques of joinery to add new beams around existing ones in barn. Traditional timber framing is the method of creating framed structures of heavy timber jointed together with various joints, but most commonly, originally with lap jointing, and then later pegged mortise and tenon joints. Diagonal bracing is used to prevent “racking”, or movement of structural vertical beams or posts.